STEVENS POINT, Wis. (January 10, 2018) -- The Stevens Point Area Convention and Visitors Bureau (SPACVB) have named its new board members and officers for 2018. Pete Theisen, Portage County Bank, has been named Chair, Noall Silvester, Holiday Inn, has been named Vice Chair, Richard Holden, Village of Plover, has been named Treasurer and Sarah Jo More, The Main Grain Bakery, has been named Secretary. Three new board members were elected including, Sherry Noska, Cobblestone Hotel, Kathy Johnson, Sunset Point Winery and Greg Diekroeger, University of Wisconsin-Stevens Point. Two outgoing board members, Ann Huntoon, Central Wisconsin Symphony Orchestra, and Peg Lewellin, were thanked for their years of service to the Stevens Point Area Convention & Visitors Bureau. 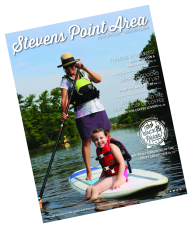 The Stevens Point Area Convention and Visitors Bureau is an economic and community development organization whose purpose is to expand Portage County’s economy by attracting conventions, sporting events and leisure tourists to Portage County. Millions of dollars from visitor spending and increased tax revenues are generated to increase commerce, sustain jobs and to create a desirable destination. For more information on the Stevens Point area, visit StevensPointArea.com. You can also find the Stevens Point Area Convention & Visitors Bureau on Facebook (facebook.com/StevensPointArea), Instagram (instagram.com/stevenspointarea/), Twitter (twitter.com/StevensPtArea), Youtube (youtube.com/user/SPACVB) and Pinterest (pinterest.com/StevensPtArea).